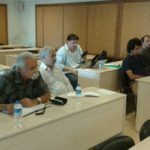 A delegation of Union of Metalworkers and Mechanics of Iran (UMMI) visited Turkey between 6th and 10th August at the invitation of IndustriALL Global Union in order to attend a trade union course and exchange views on trade union issues. The delegation was hosted by DISK, the Turkish Trade Union Federation and the United Metalworkers Union of Turkey. During this stay in Turkey, the UMMI delegation met with Mr Kemal Ozkan, Deputy General Secretary of IndustriALL, and Mr Walton Pantland, Director of Communication, and officers and leaders of the DISK Trade Union Federation and the United Metalworkers Union of Turkey and discussed the condition of the trade unions in Iran, the situation of working people, the policies of imperialism against the working people, the war in Syria and the issue of migration defence of refugees in Europe and activities and struggles of DISK and the United Metalworkers Union of Turkey. The delegation of the Union of Metalworkers and Mechanics of Iran (UMMI) also received a comprehensive briefing about the international work and struggles of IndustriALL, the history of struggles of DISK Trade Union Federation and the United Metalworkers Union of Turkey. At the conclusion of discussions and events in Istanbul IndustriALL, DISK Trade Union Federation in Turkey and the United Metalworkers Union of Turkey expressed their solidarity with the working people of Iran and UMMI. Details of the meetings and discussions of the UMMI delegation will be published in due course.